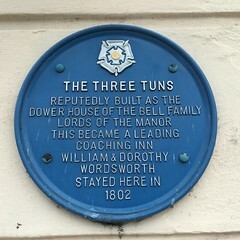 The Three Tuns. Reputedly built as the Dower House of the Bell Family, Lords of the Manor, this building became a leading coaching inn. William & Dorothy Wordsworth stayed here in 1802.